Hello everyone. I ran this little code by MG and a few others in the know before I decided to post this here. It's a pretty simple way you can have your cake and eat it too. I've been running it for a while with no problems. quotes = "Correct me if I'm wrong, but hasn't the fine line between sanity and madness gotten finer? " 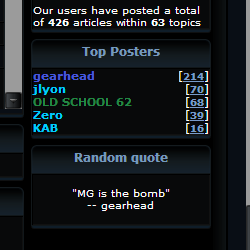 quotes = "MG is the bomb"
Good one GH, I'm sure it will get used. 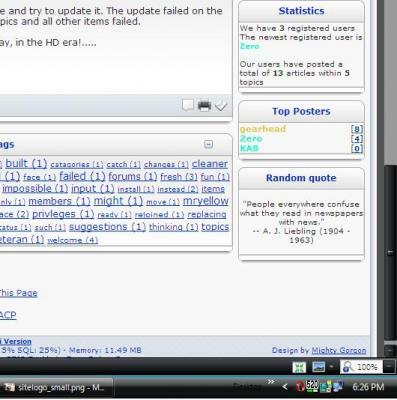 I may even try it with random pics that don't have to be part of the IP System. Thanks, Lopalong. That's a good idea, and thanks for the help in refining the code to be more W3 compliant! One of the things I like about the code is the spacing is just right, and the text looks smoother than the standard block. Well here's a pic option that I played with, but like all script, the markup has to be written to suit the location. I'm not going to support anything like this because there are so many of these type of scripts on the web, and not only that - It gives the user the chance to "Play & Learn" something by modifying it. /* This can be used for positioning etc. // This is also legitimate if you want to swap out to a full picture. // The first img entry is the full pic path, the second is the pseudo thumbnail (reduced by the css). So all they need is 6 pics of any size, add a title if they wish and set the paths accordingly. Thanks. I intend on trying this one too!